Department. Available vacancies in Chhattisgarh PSC SSE Commercial Tax Inspector Recruitment Exam are 40 posts, filled through CG State Services Exam- 2018. Interested applicants can get the applications for the post CGPSC CTI Jobs at the official website of CGPSC www.psc.cg.gov.in. Last date to send CGPSC SSE Exam CTI Applications is 05-01-2019. Candidates will be selected for CGPSC Commercial Tax Inspector Jobs is on merit basis in Prelims Examination, Mains Examination & Interview. CGPSC SSE Prelims exam date is 17th February-2018 and Mains Examination date is 21/22/23/24th June-2019. 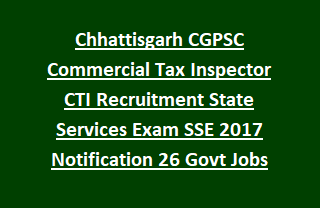 More details of CG PSC Application procedure, Selection Process, Age limits, Application fee of Chhattisgarh CGPSC Commercial Tax Department Commercial Tax Inspector (Vanijya Kar Nirikshak) Recruitment State Services Exam 2018 are given below. CGPSC SSE CTI Mains Examination date: 21/22/23/24-06-2019. Post Name: Commercial Tax Inspector (Vanijya Kar Nirikshak): 40 posts. Department Name: Vanijya Kar (Commercial Tax) Department. Candidate need to visit CGPSC SSE notification for qualification details. Candidate minimum age should be 21 years and maximum age should be 40 years as on 01-01-2018. See the CGPSC SSE notification for more relaxation details. Pay Scale for Chhattisgarh Vanijya Kar Department CGPSC CTI Jobs is Rs. 5200/- to Rs. 20,200/- plus Rs. 2400/- GP. CGPSC CTI vacancies selection will be based on candidate merit in following stages. CG SSE Prelims Examination consists of two papers. Paper I: 100 questions for 200 marks. Time duration is 2hrs. Paper II: 100 questions for 200 marks. Time duration is 2hrs. Date of the CG SSE Prelims Exam will be on 18-February-2018. Interested candidates may apply for CTI Jobs in CGPSC SSE recruitment using the official website of www.psc.cg.gov.in from 07-12-2018 to 05-01-2019. Upload the signature copy, Photo image and other documents along with CGPSC CTI Application form.